Just before Christmas a number of community groups were invited by Cllr Tony Hunter, the Portfolio Holder responsible for the scheme, to inspect the work so far on the Town Hall (& Museum), ask questions on aspects which are of concern, and ‘to contribute to the Council’s approach as their arrangements for operating the two areas are formulated’. The museum was out of bounds due to the presence of display equipment strewn around awaiting installation, so we could only peek at it from the access area on the ground floor and through the windows from the hall gallery on the first floor – but it looked very smart! The main hall looked fairly good apart from some damp areas on the walls, which should dry out and will be painted over before the opening. The floor was well finished and is still sprung and assurance was given that its future maintenance is being dealt with – a comfort to all the country dancers. The wall across the stage seems as solid and irreversible as we had heard. The reason for installing that had been to provide storage for the museum behind it, down to the basement level. However that area is very damp, has been for a very long time, and improving that seems likely to be an expensive business. Not ideal for museum storage. The cable ducting in the main hall and the ventilation ducts at the top of the gallery are less intrusive than feared, and may be the price that had to be paid for modernising the building, as are the ventilation fans in the foyer – OK if you don’t look up! The site does not have cooking facilities, so any catering for events will have to be prepared elsewhere by approved suppliers. The Lucas Room is bright and equipped for conference use. John Robinson, the council officer responsible for oversight of the scheme, then gave a presentation, including some of the issues that he faced with Hitchin Town Hall Limited, the group representing the community. He focused on the publicity given to the stage wall in February 2014, and with the “unauthorized” photograph which appeared in the local press, apparently contravening the Development Agreement that existed between NHDC and HTH Ltd. He did maintain that the wall is reversible (like Stonehenge, it could be dismantled?). Cllr Tony Hunter was subsequently reported as saying that the specifications for the wall were known to HTH Ltd, but there seems to be some confusion about the definitions used – was it supposed to be a stud wall or a solid weight-bearing wall? Other members of the Council team were there – Cllr Frank Radcliffe and ex councillor Tricia Cowley, as members of the Project Board, and Ros Allwood, the museums manager. Discussions continued on the safety of the stage area, the limitation of only one dressing room – John Robinson said that a second room could be made available – and the delay in opening. The delay in opening both areas hinges on the dispute between NHDC and HTH Ltd, the counter claims of breaches in the so called Development Agreement, and the ownership of 14 & 15 Brand Street. The latter were brought into the scheme, with great vision and with promised funding by HTH Ltd, and the footprint of those properties has allowed a much larger and open area for the museum reception. However the bank that HTH Ltd used has now appointed a receiver, the business plan for HTHLtd having been shredded. That was the subject of a last minute item on the agenda for the Full Council Meeting on January 21st. 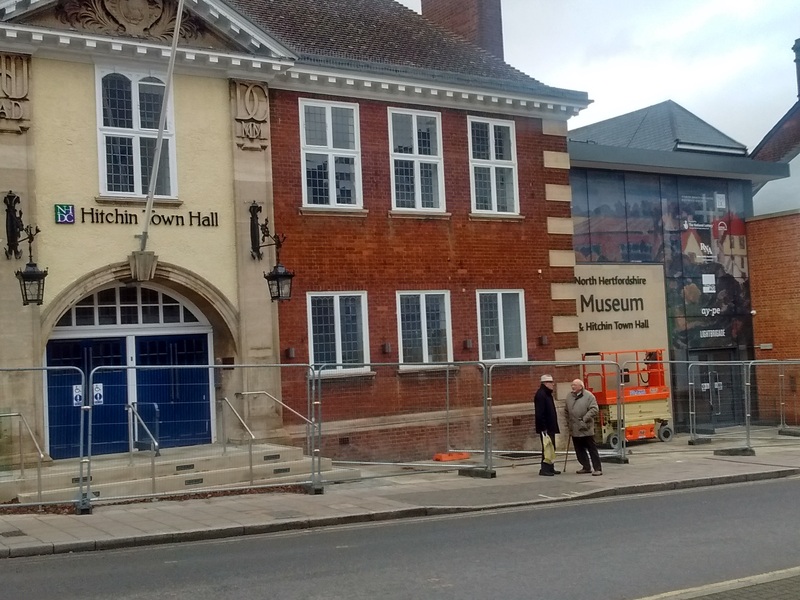 News on the opening of the Town Hall (sometime in May) and the museum (when the legal and contractual issues are sorted) was revealed by NHDC on March 6th – click here for the announcement. 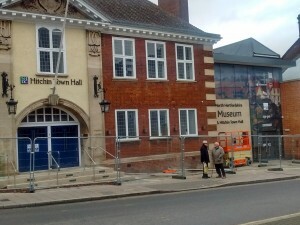 Meanwhile NHDC expects to manage both the museum and the Town Hall together for the next three years. Hitchin Initiative put forward a hopeful suggestion that thereafter a joint operation with the community might be made possible. A Phoenix project which could rise from the fire of recent exchanges?